Had a nice chat yesterday with some great folks from Sudbury, including an exercise physiologist/kinesiologist who works in a paediatric weight management program. We were chatting about whether or not I would consider a trench talk that highlighted paediatric obesity topics. Now I've often been asked about whether or not I see kids, or whether I'd be interested in setting up a program to help. Here are my two lines in the sand. 1. I'd only ever recommend involving kids directly in treatment if they already suffered with weight responsive conditions (diabetes, hypertension, sleep apnea, etc. ), and then only within the context of a program that explicitly excluded weight as a focus of treatment. 2. For kids without weight responsive conditions I'd only want to work with their parents. I worry about the impact a tertiary or community based medical weight management focus might have on kids' relationships with food, body image and self esteem, and so for the kids with problems, they might benefit from a clinic focusing on improving their specific health problems through lifestyle change and a non-weight centric focus, while for kids who don't have problems - studies to date suggest parent exclusive treatment is just as good or better than treatment that directly involves the children. Now I know nothing about the program in the graphic up above - and truly it may be a world class program - but how might you feel if you were a kid who needed to go there? Would you feel "new hope"? Or might you feel shame? 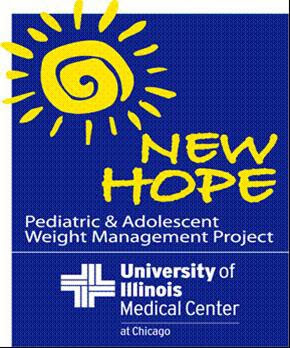 I'm not saying it's fair, just that society has associated weight with personal failure, and while I disagree with the linkage I don't think my disagreement will change the fact that there are likely kids going to New Hope, where fair or not the name alone gives them cause not for hope, but for despair.